Last week, Brigette was outside checking on her Spring bulbs — willing them to grow faster, of course — when a little bird flew past and landed in the tree in front of her (above). He headed straight to the birdfeeder and began a 30-second fussy chirpfest, as if to claim the feeder as his own. 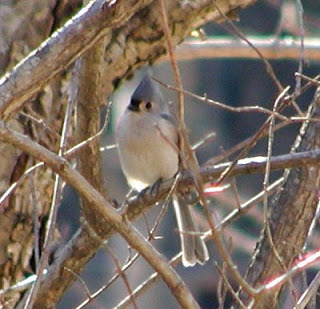 More about the Tufted Titmouse: The Tufted Titmouse is a small gray songbird with dark black eyes, a short gray tuft on top of its head and a black square on its forehead. It lives in the eastern United States and likes the forest. The male and female look the same. 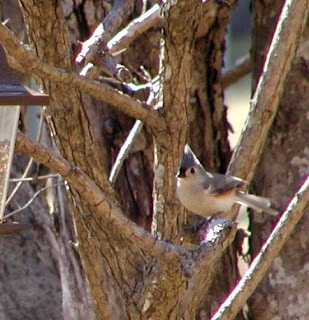 Our friend and local birding guide, Wezil Walraven of Wezil Walraven Bird Tours LLC tells us that the Tufted Titmouse stays in our area all four seasons, as opposed to other species that migrate elsewhere during the year. 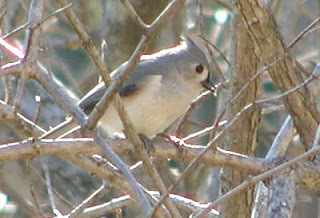 You can learn a lot more about the Tufted Titmouse and listen to its song at the Cornell Lab of Ornithology website. 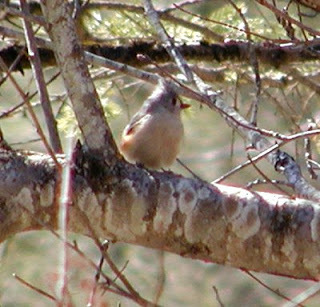 As a site on the North Carolina Birding Trail, we hope to introduce you to lots of other birds this year. 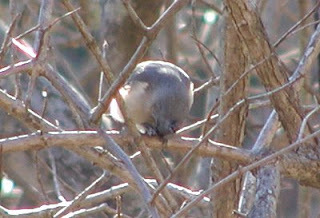 You can learn more about the North Carolina Birding Trail at www.ncbirdingtrail.org. Birding enthusiasts, be sure to bring your binoculars and camera when you stay with us!